Every addition to automation seems like a little victory brimming with potential future prospects. 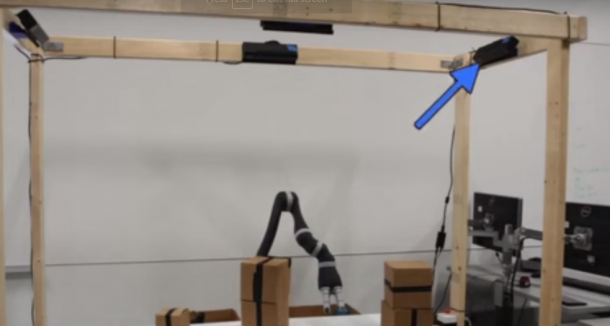 Researchers at University of Duke mark a breakthrough as they successfully tested a real time motion planning robot which operates 10000 times faster than the previous technology and uses 15 times lesser energy. In a cluttered and disordered environment, the goal lies in navigating through efficiently, with robust obstacle avoidance. The system becomes greatly desirable with the usage of fewer resources. The existing techniques take seconds on general purpose central processing units and hundreds of milliseconds on power hungry CPUs. This robot takes the better of the two. The environment is discerned using the four Microsoft kinect which are fixed above and around the working area as shown in the figure. The circuits are implemented using the field-programmable gate array and the robotic arm. Motion planning is done using the road maps. Road maps are nodes connected to each other by a possible path. The system checks for the possible paths prior using the Kinect. To avoid expensive computation during the run-time, each movement of the arm runs a check through the circuits which gives a true or false value on whether this motion runs through obstacles. All the motions can be checked for collisions simultaneously in parallel, hence the improved speed. The system incorporates longer delays between desired executed positions and actually presenting a path for the motion to itself. A lot of time in this is utilised in planning the motion. The collision detection begins when the red button is pressed. The arm begins moving immediately with no delay.